Fresh green beans were on sale recently and I was looking for something other than the usual cook in the slow cooker with bacon and potatoes way I make them. Everyone in my family raved about these and they will be a staple from now on. Delicious buttery, garlicky green beans topped with coarse salt and cracked black pepper. 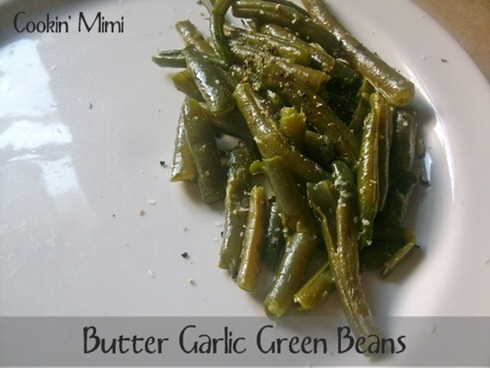 Snap stems of the green beans and break into smaller pieces if desired. Bring a large pot of water to a boil, add salt and the beans. Cook for 3-5 minutes or until almost as tender as desired. Remove beans using a slotted spoon and plunge immediately into a bowl filled with ice water. In a skillet melt butter, and cook garlic until fragrant. Add the 1/4 cup of water and the drained green beans. Cook until heated through, stirring occasionally. Season with coarse salt and cracked black pepper, serve hot. Perfect! OH how I love to dress up veggies. We will enjoy this soon. Thanks for linking up at Weekend Potluck. Thank you so much for the lovely comment. 🙂 Hope you have a blessed weekend.